The 20th year anniversary party! Our Feats of Strength will be measured on the stage with a world class Dueling Piano Show! And don't fret, a portion of your ticket sales will certainly be donated in your name to the Human Fund. Be part of Washington's most popular free holiday event, the Kennedy Center's Messiah Sing-Along. Join us for some Christmas cheer and caroling on the waterfront. Led by the Gay Men’s Chorus of Washington, DC, all are invited to participate in an evening of singing cherished holiday favorites. Celebrate the holidays with a portrait of Santa and your favorite pet while enjoying all the season has to offer on our patio. Warm up with seasonal food and drink specials for you and your best friend. A portion of the proceeds will benefit City Dogs Rescue & City Kitties. Entrance is FREE! We are also teaming up with the Arlington Food Assistance Center, so PLEASE bring in food for donation during our UGLY SWEATER PARTY! Come and join me along with Vince Smith, Emory Diggs, David B. Cole and Manny Kellough for and evening of Jazz and Blues. Joe Herrera & Rodney Richardson's "Holiday Party"
Rodney Richardson is a jazz guitarist and educator from the Washington, DC area who recently relocated to the great jazz city of Chicago, Illinois. Capture the joy of the season with a beloved Washington tradition! Take a break from the hustle and bustle of the holidays to join the Choral Arts Society of Washington for an evening of enchanting Christmas music that will fill you with the joy of the season. Early notice, Christmas Eve we'll be having our "Seven Fishes Dinner" ... get in there early! We'll have TWO special Drag Brunch shows for anyone sticking around DC over the holiday--and your first mimosa or bloody mary is on us. Get your tickets before they're gone! 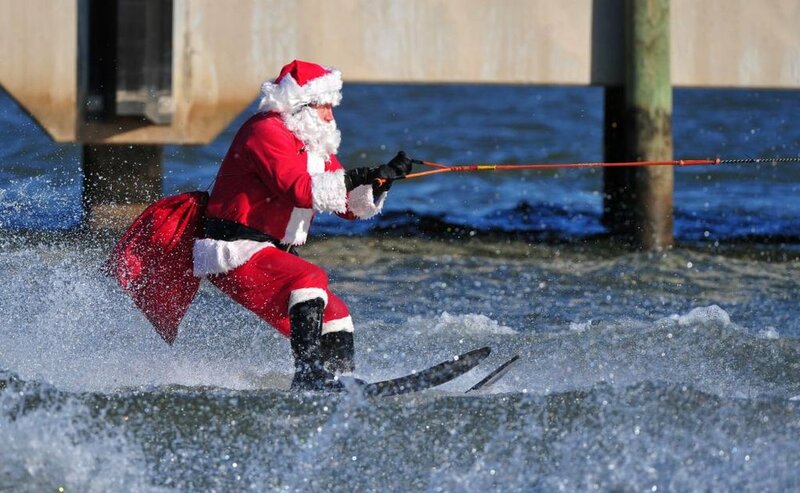 Join us at Alexandria's Old Town Waterfront to see the Waterskiing Santa and Frosty the Snowman along with the Jet Skiing Grinch along with many other. Join the DC Sisters of Perpetual Indulgence for a Monday night hymn sing or belt out a pop tune or a ballad or show tune with your friends. Join other young professionals this December 25th to deliver much-needed food packages and gifts to low-income, isolated seniors living in the Columbia Heights neighborhood. Exact address will be emailed to those who register. Kwanzaa Celebration: Nana Malaya Rucker "The Dancing Diplomat & Nubian"
This exciting family program combines the masterful skills of dance, music, storytelling and more by Nana Malaya Rucker, "The Dancing Diplomat" with plenty of audience participation and African percussive instruments. Annual Citywide Umoja Kwanzaa Celebration. Honoring the 51st Anniversary of Kwanzaa. Join the U.S. Botanic Garden for a festive evening of holiday music. 40 Thieves have established themselves as one of the best-loved Irish bands in the Metro DC area. The Improv is proud to host an open mic night featuring local comics in our main showroom. Stay warm in our studio, while we take through the steps of the DC skyline covered in snow.